Gary Scotcher struck 51 for Nassington against Bourne. Holders Oundle steamed into the quarter-finals of the John Wilcox Trophy with a nine-wicket win over King’s Keys at Milton Road on Sunday (May 15). Oundle made light work of the city side’s respectable 207-8 in the Rutland League knockout competition thanks to half centuries from Pete Foster (71no), Mark Hodgson (53) and Alex Martin (52no). Archie Stroud made 84 for Bourne against Nassington. Oundle will now play Nassington in a last-eight tie next month. Nassington overcame a strong Bourne team by 61 runs in a high-scoring first round match. Veteran Gary Scotcher (51) led a consistent Nassington batting effort which culminated in a 50-over total of 296-7 and despite top knocks from Archie Stroud (84) and Jordan Temple (65) - they put on 97 for the fifth wicket - Bourne fell well short of their victory target. Dan Bandaranaike bagged 3-33 for Nassington. Biggest winners in round one were Burghley Park who demolished Orton Park by 182 runs after piling up 266 all out. Sam Nicholls (81) and David Platt (58) top scored for Burghley, while David Young (42) scored exactly half of Orton’s 84. Nick Fisher (5-33) and George Swallow (4-48) bowled unchanged for Burghley. 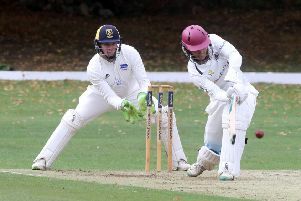 Rampant Aussie Jack Hargreaves continued his run-laden summer with an unbeaten 61 as Wisbech eased past Ufford Park by eight wickets to set up a juicy quarter-final at Peterborough Town. Jamie Gollands claimed 4-12 as Ufford were shot out for 138. Hargreaves also took two wickets. Newborough were well beaten by Grantham and Division One side Barnack sneaked home by one wicket on a tricky surface at Division Three outfit Werrington. Last season’s losing finalists Stamford Town conceded their tie at Hampton. Kettering Town conceded their game at Peterborough Town. Oundle 211-1 (P. Foster 71no, M. Hodgson 53, A. Martin 52no). Nassington 296-7 (G. Scotcher 51, T. Norman 49, A. Bandaranaike 37, J. Pope 32no, H. Craig 30, D. Bandaranaike 26, B. Keast 2-36, B. Collins 2-50, J. Berry 2-62). Bourne 235 (A. Stroud 84, J. Temple 65, T. Dixon 29, D. Bandaranaike 3-33, J. Pope 2-22, H. Bashir 2-23, C. Craig 2-39). Grantham 209 (R. Carnelly 86, A. Fisher 4-45, K. Ellery 3-30, S. Barlow 2-38). Newborough 140 (G. Rowland 34, A. Fisher 32, V. Parvathaneni 26, N. Stevenson 6-42). Burghley Park 266 (S. Nicholls 81, D. Platt 58, N. Fisher 33, A. Boothman 3-36, G. Meichan 3-67). Orton Park 84 (D. Young 42, N. Fisher 5-33, G. Swallow 4-48). Ufford Park 138 (R. Bapodra 38, P. Bentley 31, J. Gollands 4-12, J. Hargreaves 2-35). Wisbech 142-2 (J. Hargreaves 61no, J. Esser 30no, S. Albutt 30). Werrington 103 (M. Hamad 4-26). Walkovers: Peterborough Town beat Kettering Town, Hampton beat Stamford. Quarter-final draw: (ties to be played on June 26): Oundle v Nassington, Peterborough Town v Wisbech, Hampton v Grantham, Burghley Park v Barnack.